Information about treatment for fluid on the lung. 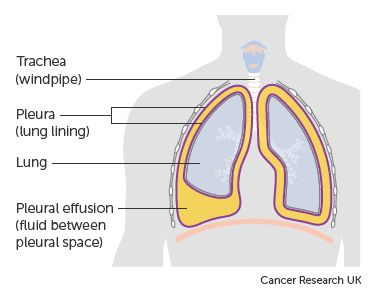 When cancer affects the lungs, fluid can sometimes collect between the sheets of tissue that cover the outside of the lung and the lining of the chest cavity. These sheets of tissue are called the pleura. Doctors call this fluid collection a pleural effusion. The fluid stops the lung from fully expanding when you breathe. So as it builds up, the collected fluid causes shortness of breath. Shortness of breath from a pleural effusion can be very uncomfortable. You might also feel anxious if you have difficulty breathing. You might find it more comfortable to sit on the edge of the bed or in an armchair. Lean forward with your arms resting on a pillow on a bed table to allow your lungs to expand as fully as possible. Let your doctor or nurse know if you find it difficult to cope. They can prescribe medicines to help you. You can have treatment to stop fluid from building up and help relieve symptoms. This treatment is called pleurodesis. It seals the space between the tissues covering the lung by using sterile talc to make them inflamed so they stick together. Then there is no space for fluid to collect. You can have this done as an outpatient if you are well enough. But you might need to stay in hospital overnight if there is a lot of fluid to drain off. This can take some time and your nurses will want to keep an eye on you. This treatment doesn’t treat the cancer. But it should make it easier for you to breathe afterwards. You can have this treatment again if it doesn't work completely the first time. There are different ways of having this treatment, depending on whether you need to have fluid drained beforehand. If you have no fluid to be drained, your doctor might put a thorascope into your chest until it is between the coverings of the lung (the pleura). The doctor can see through the tube so they know exactly where to put the sterile powder. 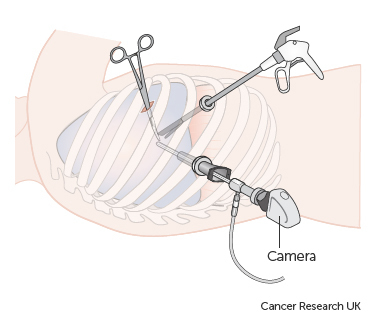 They can put the powder in through the thorascope tube. This way of doing pleurodesis is called video assisted thoracoscopy. If you need to have fluid drained from between the pleura beforehand, your doctor will first give you a small injection of local anaesthetic. When the anaesthetic has worked, the doctor puts a wide needle (cannula) into your chest, ususally through your side. The tip of the needle goes into the pleural space, where the fluid is collecting. Once it is in the right place, the doctor attaches the needle to a drainage tube called a chest drain, which in turn is attached to a collecting bottle or bag. Your doctor puts a stitch around the tube to hold it in place. This is called a purse string suture. As long as the drainage bottle or bag is kept lower than your chest, the fluid drains out automatically. If there is a lot of fluid, this can take several hours. It has to be done slowly, because draining a large amount of fluid too quickly can make your blood pressure drop suddenly making you feel faint. Also the lung expanding too quickly can make you more breathless. 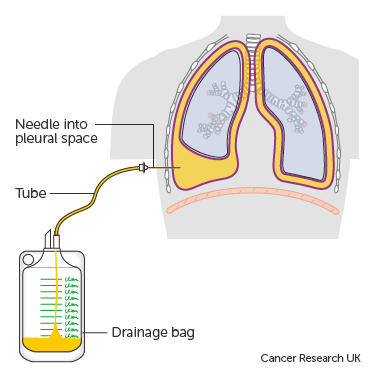 Once the fluid has stopped draining, the doctor injects the powder into the pleural space through the drainage tube. They then clamp the tube and leave it for an hour. To help to spread the powder around the pleural space, you need to lie in different positions. Your doctor will ask you turn from one side to another. After that, the drain might be attached to some suction. This helps to stick the pleura together. This part of the process can be a bit uncomfortable, and you may have painkillers to take beforehand. For most people the soreness is mild and doesn't last long. But do tell your doctor or nurse if it is a problem for you. After this, your doctor or nurse will take the tube out and pull the stitch tight to close the small opening in your chest wall. The stitch has to stay in for about a week. There is ongoing research into ways of draining fluid from the lung. This trial is looking at 2 ways to treat fluid around the lung. The researchers are comparing the usual way of draining fluid from around the lung and sticking the pleura together with a new method. The new method uses a tube that stays in the pleural space long term. It is called an indwelling pleural catheter (IPC).